I made this post on the Junk Rig Association technical forums. I’m quoting it here for the record, and so that anyone interested can follow the discussion. I’m inexperienced with junk rig but (I hope) learning fast. So far I find the flat-sailed HR rig on Tammy Norie lacking drive below F4 and unable to make progress to windward in light airs in a chop. This may just be poor technique on my part, but when I bought her I was definitely thinking about making a more up-to-date sail. I have offshore ambitions. The fantail rig just looks right. I admit that I have not done any homework yet, but I made this crude overlay by matching the waterlines of Tammy Norie and this fantail, just to get an idea if it’s at all feasible. It quickly raises one question: does the mast position of the Coromandel rule out the fantail (at least, the standard one). If so, what can be done? But also, what homework should I be doing? This weekend I plan to take Tammy Norie to Blythburgh, where friends are going to the Latitude festival, stopping to visit Southwold. The back-up plan is to sail the Ore and the Alde and visit Aldeburgh (where those same friends are sleeping). I’ll have a non-sailing friend with me, and winds are looking pretty light, so we might well end up in the Ore and Alde. Dylan Winter has made films about Southwold and the Blyth and several about the Ore and Alde, where he overwintered. It all looks wonderful. The tides are a problem. I’d need to enter the Ore a little after low water, not only to ride the tide in, but to ensure that I don’t get stranded should I make a mistake. Low water at Orford Haven Bar is at 22:53 on Friday. But Sunset is 20:59. I really don’t fancy doing it in the dark. So it’s not very practical to enter the Ore on Friday. 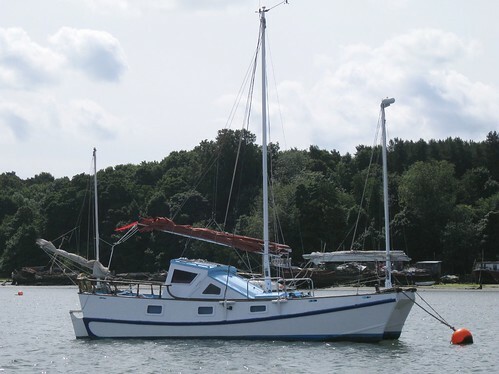 Tammy Norie is at Suffolk Yacht Harbour and it’s about 13 NM from there to the Orford Haven Bar, so about three hours. Southwold is 33 NM, more like eight hours away. We can’t enter Southwold on the ebb, and low water is at 22:09. Tidal currents will be running north around the coast between 17:30 and 22:30 and will be running south before 16:30. We’re only a quarter after springs so they’re fairly strong. All this argues for setting out from Suffolk Yacht Harbour in the early afternoon then heading all the way to Southwold, arriving around 22:00 and entering in the dark. If things don’t work out we can ditch (back to Shotley if necessary), get up early, and ride into the Ore after low tide at 11:00 on Saturday. If you do get stuck, do not leave the boat under any circumstances as the mud is deep and treacherous. However, with some careful parking I believe we’ll be able to go exploring in the inflatable kayak. Most of the river is a bird sanctuary and it ought to be beautiful. Tammy Norie now has a callsign! Now I can *cough* use the radio. Ships Radio Licences are available free from Ofcom. This post follows on from East Coast launch weekend, part one. 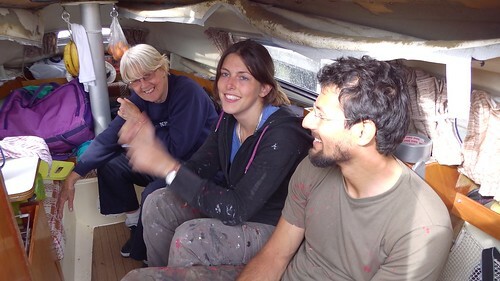 After our visit to Auriga, Mum, Dad, and I sat down in the sun in Tammy Norie’s ample cockpit with tea, wine, crisps, and cake, and discussed philosophy for an hour — a favourite pastime of people on boats — before heading off for a curry with Igor and Giulia. We all went to bed reasonable early, as Auriga was due to be craned back into the water at around 07:30 the next morning. 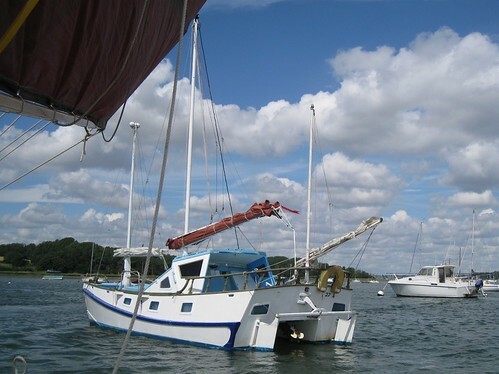 The next morning the boat yard were quite busy moving other yachts around, and as the tide was on the ebb and there was little wind, I decided that we ought to set off early in order to get back to Suffolk Yacht Harbour in engineless Tammy Norie. Our friends had to forego their try-out in a junk rig, and we had to forego watching Auriga float again. We paddled and sailed out of Fox’s and headed back down the river. I need not have worried. As soon as we passed under the A14 road bridge a westerly breeze appeared, and we were soon charging along on a broad reach at 5 knots. In fact, we slackened sail in order to slow down, but it didn’t help all that much. Tammy Norie seems determined to keep going no matter how I trim. I suppose it’s a feature of the Junk Rig that I’m not yet used to: there’s no flogging the sail to depower. As we passed Pin Mill we were all gazing over and wondering about the boats moored up outside and on the shore. It was only 10:00 so we spent an hour tacking between the moorings. One boat in particular stood out. A three-masted junk-rigged catamaran that certainly looked like a custom build. It had no obvious name, and the Junk Rig Association directory does not have a boat at Pin Mill. Do you know anything about it? Leave a comment! We saw several other crews on their boats on moorings around Pin Mill, and waved and had short conversations as we passed. “Nice rig!” called one, and his dog barked in agreement. Around 11:00 we turned off the wind and rand down and in to Suffolk Yacht Harbour without incident. By this time we were getting pretty good at sailing on to a pontoon. We packed our stuff, cleaned up the boat, and had lunch at the converted lightship. Then it was my turn to solo out to the arranged mooring and paddle back in the kayak. Well, I made two mistakes and learned two useful lessons. To get off the pontoon, I raised the sail while Mum and Dad hauled on the mooring lines to give me a start and get me clear of the neighbouring boats. The wind was about SE4, not entirely favourable for getting out, but I was sure I could nurse Tammy Norie out of the narrow channel with care. Unfortunately, as I was heading to the south-east edge of the entrance a massive motorboat bore down on me. Instead of standing on and asserting myself (being under sail) I bore away to get out from under, and was blown onto the mud. A friendly passing Macgregor 26 “Sara” pulled me off towards the fairway with the comment “engine trouble?” Thank you Sara! On reflection, I’m not sure I could’ve trusted the mobo to behave properly, and I might have caused a collision if I had asserted myself. I’d much rather suffer a little embarrassment. Sailing out to the mooring buoy was easy. I prepped a bow line along the port side, approached it at a distance on a starboard reach, then turned up with it on the lee. I was quite pleased with myself as I reached easily over the side of the cockpit and passed my line through its loop. That was, until Tammy Norie failed to stop! The wind, of course, was on my starboard side, and the sail on the port. Wind pressure was acting directly against Tammy turning her bow on to the buoy and coming to a stop. Oops! I made off the mooring line on the port quarter and slackened the mainsheet, hoping to allow the sail to weathercock so that I could lower it. No chance. Of course, what I needed to do was gybe. The sail was mostly down, so I was able to just grab the mainsheet bundle and haul the sail over. Tammy Norie obediently swung round, the buoy slid up to the bow, and everything settled down. Lesson: pick up buoys on the windward side! On reflection, when making a mistake like this I should’ve just let go the mooring buoy, had a think, and come round again. Packing up Tammy Norie took a while: sail cover, oars, horseshoe buoy, seacocks, bilge, etc. etc. I used the anchor rode to make a double sheet bend around the buoy’s loop, backed up with a Yosemite bowline, and a stopper knot on top of that, all threaded through the anchor roller. Then just to make sure I slung a loop of rode around the whole buoy, fed through the bow fairleads. I don’t think that’ll come undone. A couple of minor things I noted as I was packing. 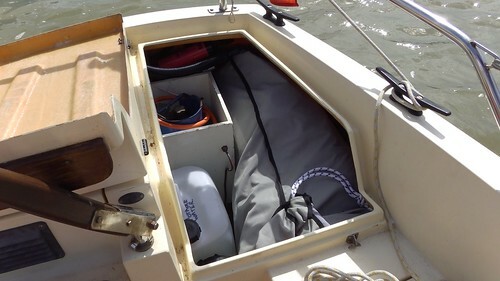 The bagged kayak fits almost exactly into the port quarter locker along with the 50 litre emergency water and the gas bottle. Nice. 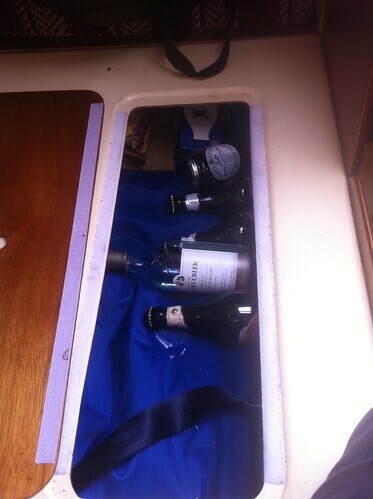 The oversized 200 litre flexible water tank (Plastimo part 16657) lies along 2m of the starboard lockers. I doubt it’ll ever be filled completely, but as it is it makes a good insulated cushion for food storage. These bottles and jars get gently pressed against the locker top by the weight of water. I’m not sure if this will work out, but it seems pretty good. A word about this rope. A lot of it came with the boat. It’s light and strong. And that is where its list of merits ends. It is awful to handle. It springs itself out of tightly tied coils in the locker. You can barely coil it by hand because it’s so springy. It burns your fingers if it moves at even low speed. It seems to have a life of its own and won’t stay where you put it. Nightmare rope. I’ll replace it as soon as I find some nice replacement mooring line. As it is I’m using some 8mm braided poly rigging line in preference. Finally, I locked the boat, inflated the kayak, and left Tammy Norie behind, pausing to take this parting shot. I hope she’ll be OK! Postscript: At the time of writing, I’m waiting for a call about the engine repairs. 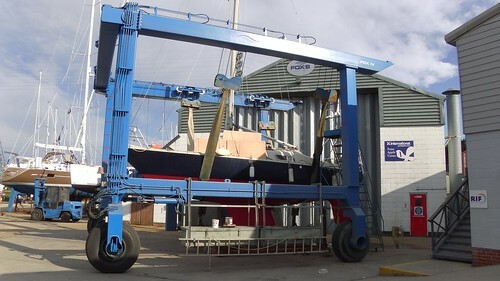 Meanwhile, Tammy Norie is based at Suffolk Yacht Harbour for at least a week. The next planned trip is to Southwold and Blythburgh. Watch the blog for updates! The first weekend of my early summer plans was both fun and eventful. It started smoothly, then became decidedly bumpy before apparently coming to a premature end stranded in the rain with a broken engine. Then suddenly the sun came out and we were under way among Thames Barges, visiting friends, and having a wonderful time again. 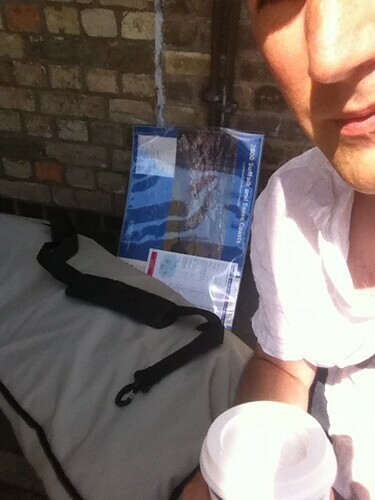 I left Cambridge station late on Friday morning, carrying Eaglet, my new Sea Eagle SE330 inflatable kayak, destined to become Tammy Norie’s tender. The kayak comes in the biggest and toughest drawstring bag I’ve ever seen, with a strong and handy shoulder strap, so I was able to pack all my weekend items including my waterproofs inside, leaving just my Imray chart pack and a cup of coffee to carry. Meanwhile, Mum and Dad were driving from Chandlers Ford to Woodbridge, towing Tammy Norie from her spot in their driveway. 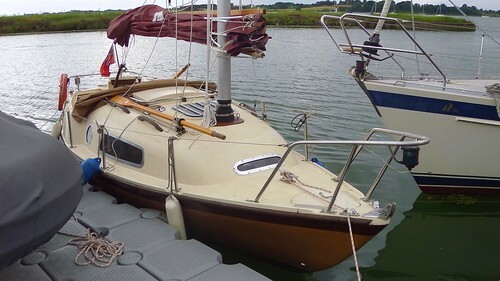 When I got to Woodbridge I had a chance to poke around in Andy Seedhouse’s chandlery shed, picking up a barometer, a nylon skin fitting to make a gas locker drain, a length of webbing to improve the mast lift, and a length of soft plastic pipe to reduce chafing from the yard parrel. Total cost £15. I also picked up a first aid kit, a few household drugs, and a pot of vaseline. On my recent trip to the Baltic I found a left-over pot of vaseline on CUYC’s yacht Kestrel and it turned out to be very useful. I used it to fix the toilet pump on the first day, and to seal the bilge pump filter on the last. It makes a pretty nice non-toxic substitute for grease in the water system. Mum and Dad arrived at about 16:30, an hour before high water, and we set about launching Tammy Norie on the slip at Robertsons Boatyard. I also arranged a couple of weeks on a swinging drying mooring at Robertsons, as I intended to make it back to Woodbridge that weekend. That didn’t happen, as you will see. Dad and I had decided to try launching by reversing the trailer into the water, rather than hiring a crane. We thought this ought to be straightforward, though the trailer, and the brakes especially, would need cleaning afterwards to prevent salt from destroying them. The water at Woodbridge tastes saltier than the Baltic, in spite of being quite a long way upstream. And so it turned out: we just had to attach the trailer to the car on some long lines and lower it and Tammy Norie into the water until she floated off. Here is a time lapse movie of the whole thing. Retrieving her onto the trailer will be another matter. Somehow we’ll need to make sure her keels are in the right position before towing out the trailer. I have plans for this that I’ll write about later. 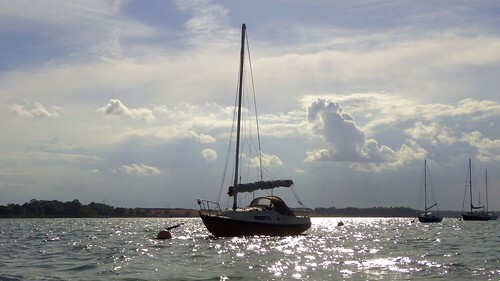 We made a quick shopping trip to the supermarket and got back as the tide was falling, jumped on board, and pushed off down the Deben under power into a force 3 headwind. A shame, but at least the tide was helping us along. My goal for that evening was to reach Felixstowe Ferry at least, and if we were feeling lively, even get as far as Pin Mill by the early hours. But about 30 minutes out of Woodbridge we realised that we’d forgotten to fill the little fuel tank. I had yet to calculate Tammy Norie’s fuel range, or even the most economical speed for the engine, and we felt quite insecure with only half a tank. The chart showed fuel at Waldringfield, so we grabbed a buoy there, inflated the kayak, and I went ashore with the tank in search of petrol. I was told in the pub that the nearest petrol was miles away. Oh well, back to the kayak, back to Tammy, deflate the kayak again, and off down the river. By then it was nearly 22:00 and getting dark, so we picked up a buoy near Ramsholt and went to sleep. By morning the wind had veered, and we were able to sail off the buoy at about 08:20 and right down the river, tacking between the boats at Felixtowe Ferry. There we saw Tammy Norie’s sister ship, Gaspar (sail number 100) on a buoy. Nobody else was sailing, though, and certainly nobody was attempting the Deben entrance. We reached the entrance at 09:30. The tide was on the ebb, and the wind was from the south, creating choppy wind-over-tide waves and not a few breakers. Time to test Tammy! 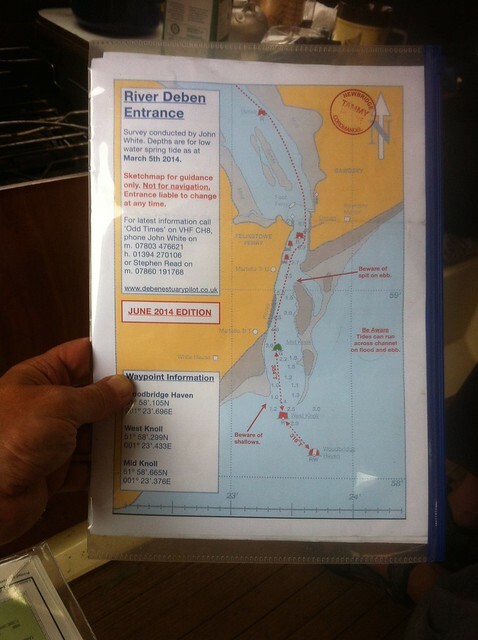 I’d previously printed the entrance guide from the excellent Deben Estuary Pilot web site and had it to hand in a plastic sleeve. We managed to get about a quarter of the way out under sail by tacking rapidly, but it was clearly going to be a struggle, and one mistake would put us on the mud for hours in some nasty conditions, so I started the engine and we motor-sailed as far as the fairway mark. From there we made long tacks, beating our way down the coast towards Landguard Point in the choppy swell. 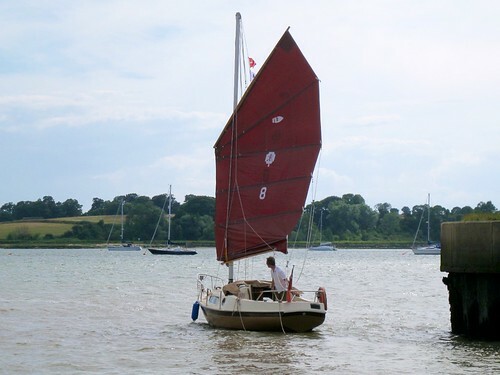 It was fun for a while, and we were making progress, but in the end we got fed up and wanted to catch the Thames Barge racing and so we motor-sailed into wind until the fuel tank was empty. By that time the wind had backed enough that we could weather the point, and then everything changed. The sea levelled out, the sun came out, and we had a delightful run into the river. We made the Shotley lock-keeper’s day interesting by sailing into the lock. He was very helpful. Shotley, it turns out, does not have petrol either, but he said they’d have some at Suffolk Yacht Harbour. We took lunch at the Shipwreck and recovered from the morning’s bumpy ride. 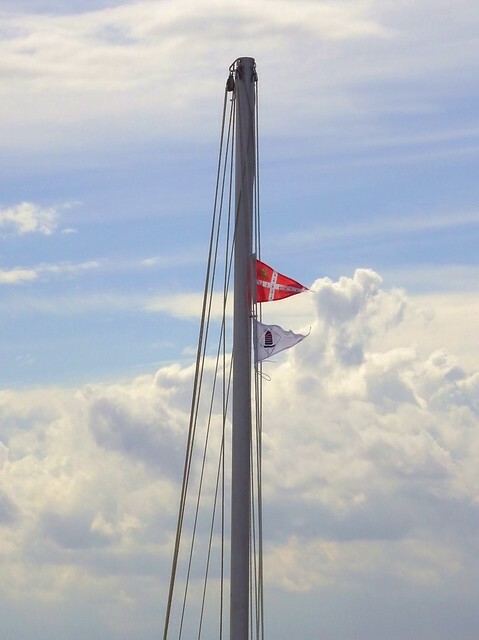 After lunch we warped out of Shotley lock and caught the now south-easterly breeze north to Suffolk Yacht Harbour. After a quick pass to look in at the visitor’s berths, we sailed right in, dropping sail in seconds just inside the entrance and using our oars as paddles to get ourselves into a very sneaky position near the fuel berth. After filling the tank with petrol we tried to start the engine, but it wasn’t co-operating. In fact, it didn’t seem to be firing at all. We tried various remedies, including Cold Start into the carburettor, and WD-40 on the high tension electrics, but it just wouldn’t respond at all. I wore the skin off the inside of a finger pulling the starter cord. 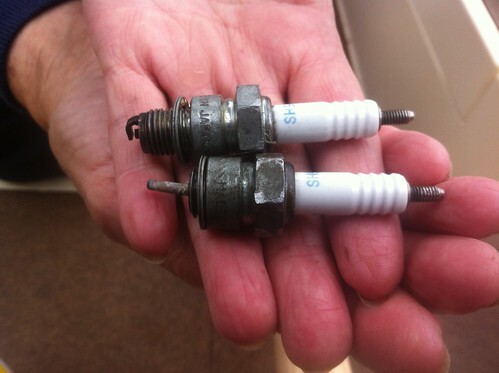 We decided to take out the spark plugs to check them and to relieve any flooding. But the spark plugs were extraordinarily stiff. The top one was hard to remove, but the lower one didn’t seem to want to budge at all. More WD-40, and then a strong tug on the spanner, and it moved. But it also made a sickening crunch. It had broken in two, leaving the stub of the plug inside the engine block. By now it was 19:00, we were tired, and it was starting to rain again, so we decided to pack up for the day. At this point I thought our weekend was over. The next morning I tried calling a couple of local companies, but it was Sunday and they weren’t likely to be able to do anything. The harbour master recommended we talk to Bob Spalding, a motorboat and engine company just inside the gate to the harbour. I gave them a call without result, but a bit later in the day we ran into Phil moving boats around inside their yard, and he said he’d come and take a look. We ended up taking the engine out and leaving it with him to try to fix on Monday morning. I talked to the harbour master about a swing mooring from Monday, and arranged a pontoon for that night while we waited for Phil to take a look. Then an amazing thing happened. We were just getting ready to move Tammy Norie along to a proper berth when I spotted a Thames Barge through the harbour entrance. Dad watched it in the distance, commented on the topsail arrangement, then said “How frustrating it all is.” At that moment, a breeze got up and the sun started to come through the clouds. I looked at the direction, thought about the tide, and made a snap decision. “Shall we go?” I said, “Let’s go!” Mum jumped aboard and we were off into the river. It was perfect. The barges had their mainsails reefed in order to take on groups of passengers safely, and we could literally sail rings around them. And so we did, and Dad got his close-up view of barges under sail at last. Barges like the one he’d restored as a younger man at Pin Mill. I was very pleased to have been able to get him close. The wind and tide continued fair for a journey all the way up to Fox’s Marina at Ipswich, where my friends Igor and Giulia were restoring Auriga for an expedition to the South Atlantic. I let them know we were coming, and we drifted up there just as the wind died for the evening lull. “I’m coming in to Fox’s with no engine,” I told Igor. “I have to see this,” came the reply. Fortunately, he brought his camera. Again, the junk rig made it all easy. Sailing Tammy Norie in tight space isn’t any harder than sailing the family Topper, and it’s considerably easier to drop the sail. 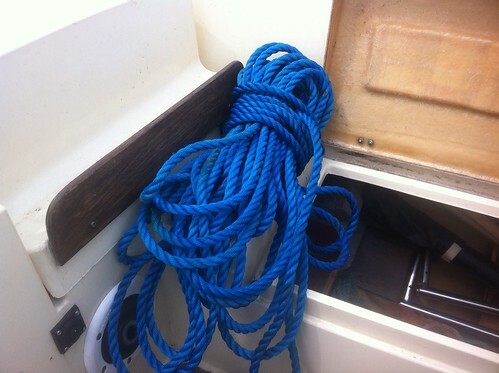 Just as you approach the pontoon you let go the halyard, step off with a line, and you’re done. Wonderful. Igor and Giulia came aboard for a look around. Then we went to see Auriga. I was curious about many things, and Igor suggested we make a tour video. You can see it on this blog under “A tour of Auriga“. That’s quite enough for the moment. I’ll write about the remainder of the weekend in a later post. 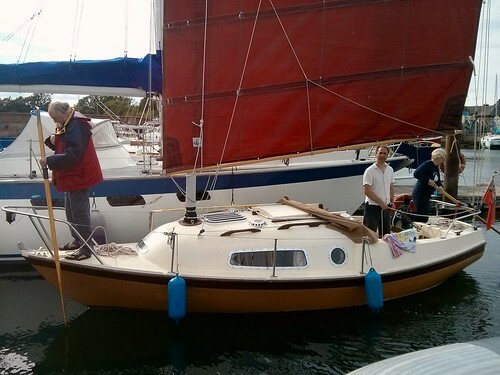 I visited my friends on Auriga (a 1973 Albin Ballad) during Tammy Norie’s East Coast launch weekend. They’re fixing up Auriga for an expedition to the South Atlantic. Igor gave me a tour of Auriga on camera. I bought an inflatable sea kayak to be Tammy Norie’s tender, partly because it’ll be so much fun in its own right. It arrived today at the office and I used it to commute home from Stourbridge Common to Trafalgar Road, stopping at the Fort Saint George for Pimm’s with Rebecca, naturally. The kayak is a Sea Eagle SE330 Pro. I’m pretty sure I sold a couple to people on the river. I ought to get rebate! Thanks to Gareth Rees for being cameraman for the unboxing. Incidentally, the sound in the second part of this video shows exactly why I didn’t buy a GoPro but instead a Panasonic HX-WA30. (Panasonic’s marketing department needs to learn a bit about catchy names, though.) 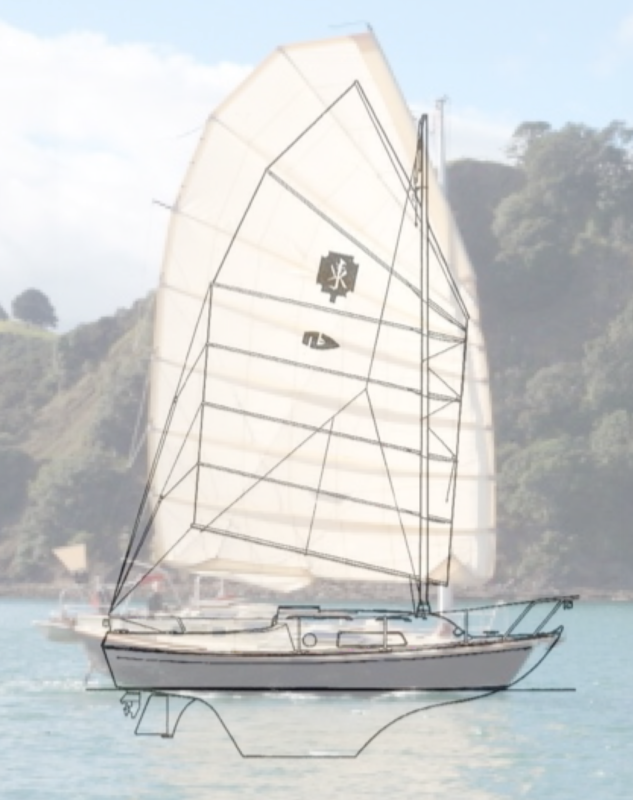 You can find out more about this in The sound of sailing – part 2 where Dylan Winter, a professional cameraman, explains the choice.